Behold. My first student writing assignment of the school year. These stories have three things going for them. They were all typed, so I do not have to decipher any bad 4th grade cursive. The students completed them at school, so I am fairly certain that this is student work, and I avoided any parent tampering. And finally, they were peer edited, so the spelling and grammar mistakes should be minimal (insert uncontrollable laughter here). To teachers and students and parents who remember being a student, “peer edit” is usually the code name for socializing during class without anyone noticing. Well, never fear, theroommom is here. 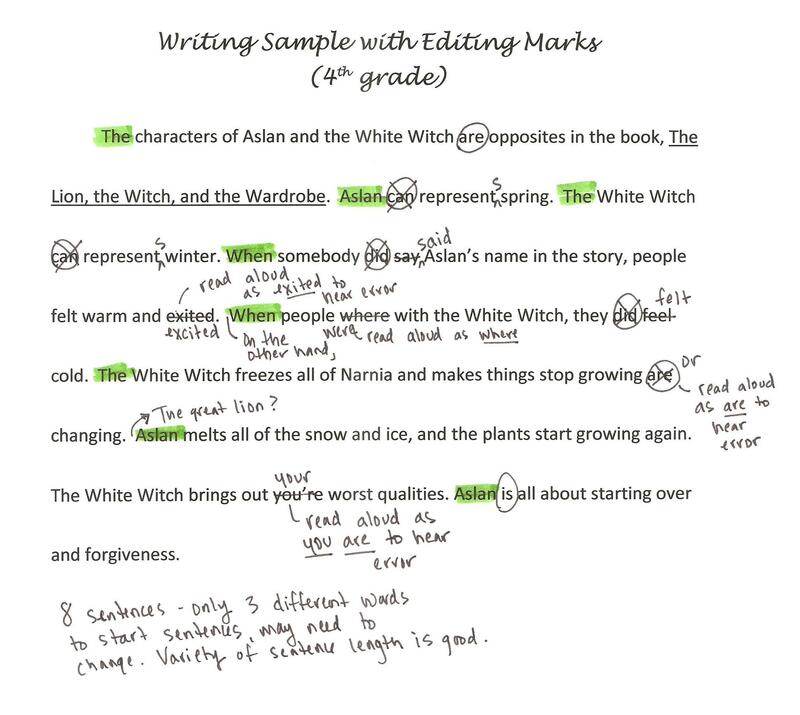 I actually have some peer editing strategies that might work for you. Not only can teachers use these in the classroom at any grade level, parents can use these techniques with their children at home without being tempted to over-help the child. Believe me, teachers know when a parent has had a heavy hand in a student’s paper! What useful tips do you have to improve writing– adult’s or child’s? Have a classmate (or parent) read the essay aloud to the writer. Read EXACTLY what is on the page. If the paragraph does not contain a period, do not pause. If the author wrote “they’re” instead of “there”, read “they are”. If the author wrote “exited” instead of “excited”, pronounce it phonetically. The writer should be able to hear problems with punctuation, misspelled, and misused words. The writer should also hear missing information or disorganized ideas. Highlight the first word of every sentence in the essay and review the highlighted words. Do you have a variety of words or did you begin every sentence with the same word? Is there only one highlighted word in a whole paragraph– or even worse– the whole essay? That means you have forgotten punctuation somewhere. Are the highlighted words the same distance apart throughout the whole piece? That means you may be using only one type of sentence (like all simple sentences) when you should have a variety of sentence types and lengths. You can also have students count the number of highlighted words if you require a certain number of sentences in a paragraph. Five highlighted words should equal five sentences. Circle any helping verbs in the story even if the verb is not being used as a helping verb in that particular sentence. Remove half. This helps to fix passive voice even if you do not understand what passive voice is. I require that my fourth graders memorize the helping verb list some time around October, and it is such a useful tool for many grammar and writing tasks. Read the essay or story backwards one sentence at a time to the writer. The writer should be listening for problems with mechanics, not content. Read one sentence and stop. Check that each sentence has an action, a person/thing doing that action, and is a complete thought. In other words, do you have a complete sentence? Editing is such an important tool. Thanks for the ideas. I like the process you use for editing. Thanks!